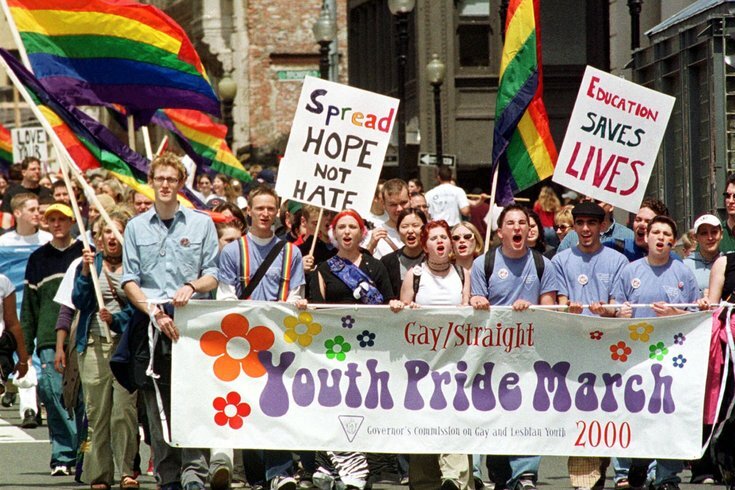 Teenagers from around the Boston area march in the sixth annual Gay/Straight Youth Pride March in Boston, Saturday, May 20, 2000. Several thousand young people took part in the rally, demanding respect and declaring their sexuality their own business. A federal appeals court on Monday rejected a fresh challenge to New Jersey's ban on so-called gay conversion therapy for minors, saying the prohibition does not violate the rights of either children or their parents. By a 3-0 vote, the 3rd U.S. Circuit Court of Appeals said the ban did not infringe the First Amendment rights of minors and their parents to receive information and exercise religion, or the rights of parents to decide how to raise their children. The challenge came from a 15-year-old boy known as John Doe, who claimed to suffer from anxiety, panic attacks, self-hatred and suicidal thoughts as he struggled with his sexual identity, and his parents, who said they had sincere religious beliefs that homosexuality was sinful and harmful. The family plans to appeal to the U.S. Supreme Court, said their lawyer, Mathew Staver. "It is a tragedy when people who are not in the counseling room try to dictate what the client wants to receive and what the counselor is allowed to offer," Staver, chairman of Liberty Counsel, said in a phone interview. Signed by Republican Governor Chris Christie in August 2013, New Jersey's law bans licensed counselors from trying to convert homosexual minors into heterosexuals. The law was upheld last Sept. 11 by the same 3rd Circuit panel after counselors claimed it violated their free speech rights. Citing that ruling, which is also being appealed to the Supreme Court, Circuit Judge Dolores Sloviter on Monday said: "The listener's right to receive information is reciprocal to the speaker's right to speak." She added: "The fundamental rights of parents do not include the right to choose a specific type of provider for a specific medical or mental health treatment that the state has reasonably deemed harmful." Monday's decision upheld a July 2014 ruling by U.S. District Judge Freda Wolfson in Trenton, New Jersey. A spokesman for Christie did not immediately respond to requests for comment. On April 8, President Barack Obama called for an end to gay conversion therapy for children, citing "overwhelming scientific evidence" that it was "neither medically nor ethically appropriate and can cause substantial harm." The American Psychiatric Association in 1973 declassified homosexuality as a mental disorder. Some conservative and religious groups have said sexual orientation can be changed.